There really is no need to be afraid of making shortcrust pastry. The pastry can be made either by hand or with a food processor. 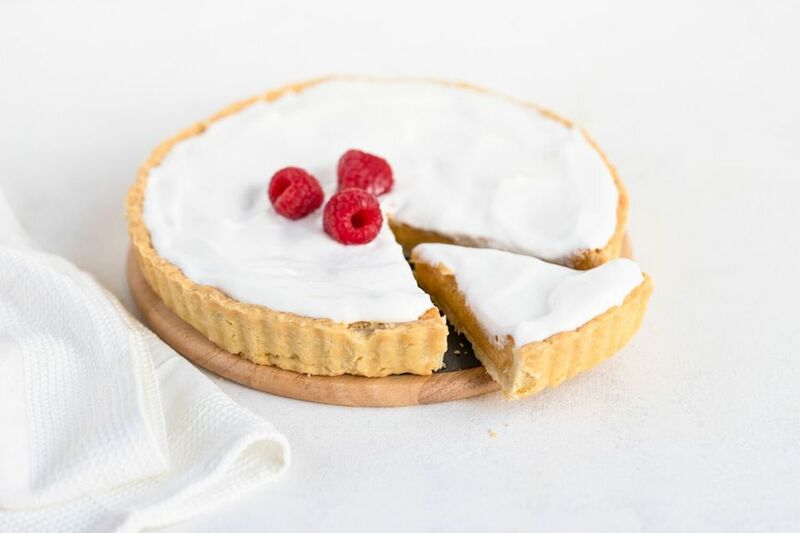 Shortcrust pastry is easy to make and it is one of the most versatile pastries as it can be used for both savory and sweet dishes. Shortcrust pastry is nothing more than a mixture of flour, usually plain flour or all-purpose, as it is known in the US, and a fat, either butter, lard, or a mixture of both. These are bound together with either cold water or with egg for a richer pastry. See tips for making a successful shortcrust pastry. This recipe is for 10 ounces or 300 grams of pastry. If you are not sure how much pastry to make, check the pastry calculator. Place the flour, butter, and salt into a large, clean bowl. Add the water to the mixture. Using a cold knife, stir until the dough binds together. Add more cold water a teaspoon at a time if the mixture is too dry. Wrap the dough in clingfilm (plastic wrap) and chill for a minimum of 15 minutes and up to 30 minutes. If you have a food processor, it can speed up pastry making. Some prefer to use a processor as the pulse avoids the over handling of the mixture which can result in hard, dry pastry—a common fault. Place the flour, butter, and salt into the bowl of the processor. Using only the pulse setting, pulse until the mixture resembles breadcrumbs. Avoid over mixing if you can. Wrap the pastry in Clingfilm/plastic wrap and chill as above in the hand-made method. Prepare Your Equipment and Ingredients: Gather together all your equipment and ingredients and weigh all of the ingredients. Preparing in this way means not only do you check you have everything, but also making the pastry is much quicker and easier with everything to hand. Keep Your Hands Cool: There is an old saying that cold hands make good pastry. The golden rule of making shortcrust pastry is keep the ingredients, the bowl and the hands as cool as possible. When the pastry mixture becomes too warm the end result is a greasy and/or heavy dull finished pastry crust. Run your hands under cold water before starting to mix pastry. Keep Your Ingredients Cool: If the butter or lard warms up too much (on a hot day, for example), then pop it in the refrigerator from time to time. Use a Cool Work Surface: Roll pastry on a cool surface (a marble slab is perfect), dusted with flour. Work Quickly: Don't dawdle when making pastry. Working quickly makes lighter pastry as the lard or butter doesn't have time to get too warm, making the pastry greasy and heavy. This is another good reason to make sure you have assembled all your ingredients and equipment. Rest, Rest, and Rest Again: Once the pastry dough is made it must be wrapped in plastic wrap or grease-proof paper and rested in the refrigerator for a minimum of 15 minutes. Resting allows time for the gluten (proteins) in the dough to relax. If you attempt to roll the dough as soon as you have mixed it, it is like trying to roll a sheet of elastic. It will roll, but seconds later shrinks back. Likewise, once rolled, rest the pastry again. If you cook pastry that has been rolled and not rested it will shrink in the oven. Use a Hot Oven: Always put pastry into a preheated, hot oven (425 F / 220 C / Gas 7). If the oven is too cool the pastry will melt rather than cook. Keep the Bottom Crisp: No one wants a soggy bottom when their pastry is cooked. To ensure your tart or pie is crisp, place a heavy baking sheet in the oven while it is heating up, then place the tart or pie directly on the heated tray.